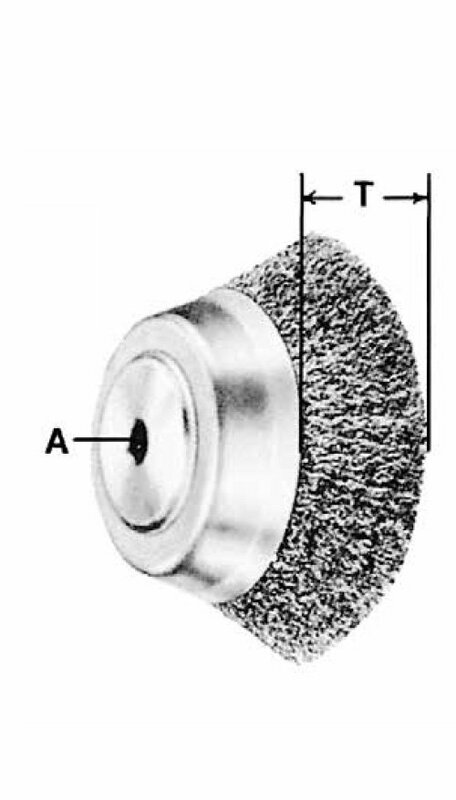 United Abrasives’ brushes consist of only the highest grade industrial tempered wire and state-of-the-art construction, designed for off-hand equipment. The various styles cover a multitude of applications. Brushes are available in a variety of wire types. The proper brush for the application should be selected based on the characteristics of the brush, including wire type. All BlueLine™ packaging is one piece per package. Knot wire brushes provide high impact action and offer low to medium flexibility through the use of twisted wire tufts for heavy duty applications, such as weld cleaning. Knot wire brushes are available in 2 knot configurations. 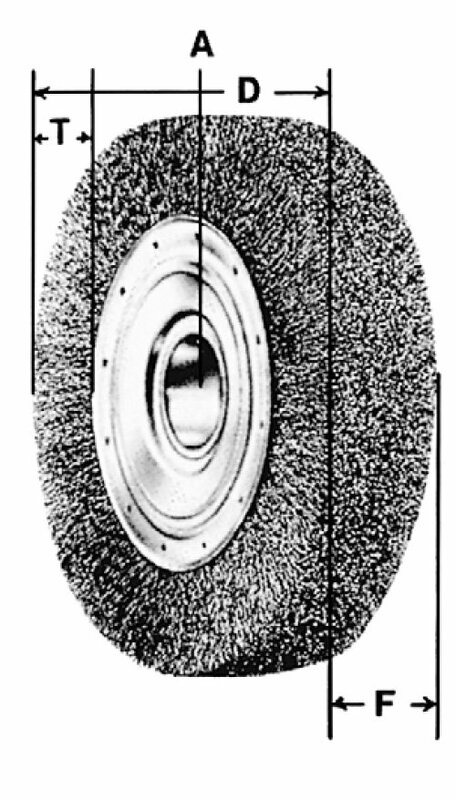 Flag at end of wire tuft provides additional brush flexibility for irregular surface preparation. Extremely narrow tufted face is ideal for bead weld preparation. Crimped wire brushes are general purpose brushes that provide higher flexibility and cleaning action through the use of flexible wire points. They offer a wider work face than knot style and are ideal for light applications such as rust or paint removal. Flexible wire points provide cleaning action for light applications. The thickness of brush wire will impact the end result of the workpiece. Fine wire such as .008 will produce a finer finish and will yield a longer brush life. Thicker wires, such as .014 and .020 or higher, will be more aggressive and will decrease production times. Carbon steel, the most durable, high strength fill material available for general purpose cleaning applications, is suitable for light to heavy duty cleaning depending on the wire diameter. non-contaminant brushing actions are desired. Safety Goggles: Safety goggles, or full face shields worn over safety glasses with side shields, MUST BE WORN by all OPERATORS and OTHERS IN THE AREA OF POWER BRUSH OPERATIONS. Comply with the requirements of ANSI Z87.1 (“Occupational Eye and Face Protection”). Guards: Keep all machine guards in place. Speeds: Observe all speed restrictions indicated on the brushes, containers, labels, or printed in pertinent literature. “MSFS” or “MAX.SFS” means Maximum Safe Free Speed (R.P.M.) - spinning free with no work applied. For reasons of safety, the “MSFS/MAX.SFS” should not be exceeded under any circumstances. Protective Equipment: Appropriate protective clothing and equipment (such as full face shield, gloves, respirator, etc.) must be used where a possibility of injury exists that can be prevented by such equipment. Before starting brush: Use eye protection and safety equipment. Inspect brush for rust, damage, speed limit, etc. If no-load speed marked on the power tool is higher than the brush speed limit, do not mount brush. Inspect and jog machine to assure the brush is mounted properly and securely, machine guards are in place, no vibration, etc. Run machine at operating speed for at least one minute before applying work. DO NOT STAND IN FRONT OF OR IN LINE WITH BRUSH.